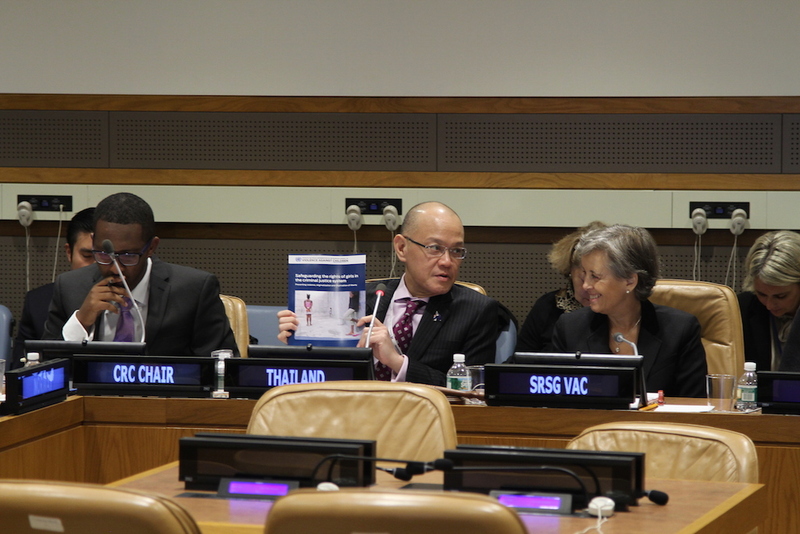 SRSG launches new report on "Safeguarding the rights of girls in the criminal justice system - Preventing violence, stigmatization and deprivation of liberty"
New York 16 October 2015 - In a high-level panel discussion, co-organized with the United Nations Office on Drugs and Crime, and the Governments of Austria, Chile, Norway and Thailand, SRSG Santos Pais launched a new study on the critical role of criminal justice systems to prevent incidents of violence against girls, bring perpetrators to justice, and ensure recovery and social reintegration for victims. Gender discrimination and gender-based violence remain pervasive, with long-lasting consequences on the lives of millions of girls. In society, in communities, in schools and in their homes, girls face specific vulnerabilities due to their gender and young age. Incidents of violence against girls are often associated with a culture of silence, shame and fear that inhibits them from speaking out and seeking help. "In many countries it is particularly hard for girls to approach police stations or courts, for fear of verbal intimidation and harassment, and of seeing their testimony dismissed. Seeking redress through the criminal justice system can be very intimidating, as girls fear that their credibility may be questioned, or that they may be blamed, rather than protected as victims." highlighted Marta Santos Pais, SRSG on Violence against Children. In his opening statement, Ambassador Jan Kickert, Permanent Representative of Austria to the UN emphasized that "Today’s discussion and the SRSG’s new thematc report is a contribution to our collective efforts to ensure girls’ freedom from all forms of violence in the criminal justice system and in society as a whole. With its special focus, the report also represents a resource for the high-level Global Study on Children Deprived of Liberty, which is a very important project." Many countries around the world face important challenges in their efforts to promote the rights of girls in the criminal justice system. Member States have a primary responsibility in safeguarding the rights of girls and paing due attention to their particular needs when in contact with the criminal justice system", said Simone Monasebian, Director of UNODC’s New York Office. The Permanent Mission of Chile, represented by Gloria Cid highlighted the importance of legal reform at the national level for the protection of girls in the criminal justice system. She welcomed the new Sustainable Development Goals and their role in securing democratic, accountable and non-discriminatory institutions for to girls and boys. Anniken Enersen from the Norwegian Ministry of Foreign Affairs added that "In order to reach Goals 5 and 16 in the 2030 Agenda, national, regional and international cooperation is imperative. We need to join hands now." International human rights legal instruments and standards, including the Convention on the Rights of the Child (CRC) provide a solid framework for preventing and responding to violence against girls in both public and private spheres. All violence related issues affecting girls are very relevant for the administration of justice, however there are wide gaps in understanding offending by girls. "Girls are judged not only for their criminal offences, but for who they are", stressed the the Chair of the CRC Committee, Benyam Mezmur. Cristina Goñi, Secretary General, International Juvenile Justice Observatory noted that "Criminal justice systems are traditionally male-dominated institutions that were built to tackle adult violence and crime. "Girls run the risk of being criminalized and exposed to harassment, unlawful deprivation of liberty and inhuman punishment, rather than benefitting from protection, rehabilitation and reintegration. While deprived of liberty, one vital aspect of protection is that girls are held separately from adults and from boys. "However, in many countries, due to their small numbers, girls are held alongside boys and adults or in facilities run by male staff, resulting in a risk of exposure to violence, including sexual violence", said Andrea Huber, Policy Director, Penal Reform International. In his concluding remarks, Ambassador Virachai Plasai, Permanent Representative of Thailand to the UN congratulated the SRSG for the report and enocuraged Member States to study the research and to implement the recommendations in their own countries. He also reminded that good experiences exist in implementing internationally agreed standard’s for girls protection in the criminal justice system, including the Model Strategies and Practical Measures on the Elimination of Violence against Children in the Field of Crime Prevention and Criminal Justice and the Bangkok Rules, and encouraged to build upon those positive examples.